Fields of Blood: It's Squid-Hand, Dammit! 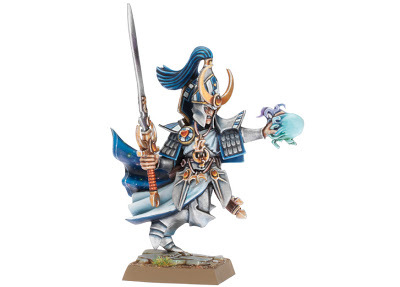 Is this the ugliest model that GW have released in a long time? [Answer is No - the Skullcannon, Scylla, Slaughterbrute and Warshrine are all far worse - but it is nice to see some of the Forces of Order receive a beating with the ugly stick). It is the ugliest infantry model that GW have done for ages. I mean some Swordmaster running into the wind and trying to fend off a flying octopii. Who dressed this guy? His mum. Check out the loveheart brooch fastening the cloak he picked up at Harry Potter Land at Universal Studios in Florida. I don't even want to hazard a guess at why he has handlebars on his helm. Sometimes Games Workshop, less is more. I dunno the others you mention are bad but they have redeeming elements this is just stupid. There's something about the dynamic pose that is really off. Which is a shame because a lot of there new single characters' dynamic poses are fantastic (I love the Savage Orc Big Boss). And yeah that man is fondling a cephalapod. He looks like he is tripping over. He's not as bad as other recent releases. I've always kinda thought he looked like he needed to go to the loo... He's even crossing his legs... Dammit guys, take this orb thing from me - I GOTTA GO!!!!!!!!!!!!!!!! Excuse me but HE are supposed to be pretty... not for us boil, puss, and muccus dripping models covered in scars, lumps and dirty rags. No in a world full of ugly we are the only beauty you will ever see. Gammy running water balloon chucker. Platemail thats so lite you can run in it and rated to parry a wet stick. As dumb as the Loremaster might look, I think the Anointed is worse, with his wings-on wings helmet and his enormous Ogre sized halberd (compensating for anything?) I know this is heroic scale, but I think GW has pushed past the boundaries of credulity (though to be honest, the Ironblaster did that). Fortunately for Mr Squid-hands here, at least he's a good Lord choice, so he might see quite a bit of play. I think he has the potential to be; all 8 of the main book signature spells makes him a very flexible and useful caster. The three magic missiles are all good value against every army out there, while the hexes and augments will help swing almost any combat in range. They're all at a base of less than 10+ to cast, or can be boosted if necessary. I think his versatility makes him very useful. He's also a fair combat character to boot. While he won't last against a Vampire Lord or Bloodthirster, he's harder to kill than your average mage, especially out on the flank in an augmented unit. He can be relatively dispelled by a Level 4, but so can any Level 2. If he's there with a Level 4 Book of Hoeth Archmage, then he might be able to sneak through a spell or two, while the DD and scrolls are reserved for the bigger spells. Heh, or have I completely missed your laconic comment and you're actually talking about the Anointed? Because I'm sticking to that comment. Mr Stupid-hat has a really stupid hat, and in comparison, the Loremaster is tolerable. OK. Well I'd still take Squid Hand over Stupid-Hat. Or Allarielle for that matter; for some reason her hair looks like the bunch of computer cables sticking out the back of a hard drive, while her staff is thicker than her arm. No James. No it is not. It is a Girly Man brandishing a Cephlapod while forgetting where he has left "My Little Pony"